Sculptures by Lauren DiCioccio and May Wilson will be on view at the Palo Alto Art Center Jan. 17 to April 12. Photo Courtesy of Palo Alto Art Center. This week, catch a contemporary version of an ancient play, hear the baroque music of a Montreal-based quartet and check out new fabric sculptures at the Palo Alto Art Center. For its 15th season opener, Redwood City's Dragon Theatre has chosen a Greek tragedy: a powerful tale of violence and revenge. Aeschylus's "The Libation Bearers" is the second book of the trilogy the "Oresteia," and the play takes as its subject the murder of Clytemnestra by her son Orestes, who is avenging his father's murder. First performed nearly 2,500 years ago, the "Oresteia" remains at the foundation of the Western theatrical tradition. Dragon Theatre's updated production runs now through Sunday, Feb. 1, with shows Thursday through Saturday at 8 p.m. and Sunday at 2 p.m. Tickets are $22 general admission, $10 for limited-availability rush tickets, and $125 VIP. There's also an opening-night gala after the show tonight, Friday, Jan. 16, as well as a post-show panel discussion on Saturday, Jan. 31, when Stanford Classics professor Rush Rehm will join the show's director, Tunuviel Luv, to discuss the play and its relevance to contemporary audiences. The discussion will be followed by a reception with the artists; tickets to the Jan. 31 event are $30. The Dragon Theatre is located in downtown Redwood City at 2120 Broadway St. For tickets or more information, go to dragonproductions.net or call 650-493-2006, ext. 2. Early music lovers take note: Montreal's acclaimed Pallade Musica makes its West Coast debut tonight, Friday, Jan. 16, when it comes to Palo Alto's First Lutheran Church (600 Homer St.) at 8 p.m. courtesy of the San Francisco Early Music Society. The grand-prize winners of the 2012 Early Music Baroque Performance Competition, the quartet will play a program of 17th-century European instrumental music, including works by Italian composers Dario Castello and Bellerofonte Castaldi, Austrian composer H. I. F. Biber and Danish-German organist Dietrich Buxtehude. 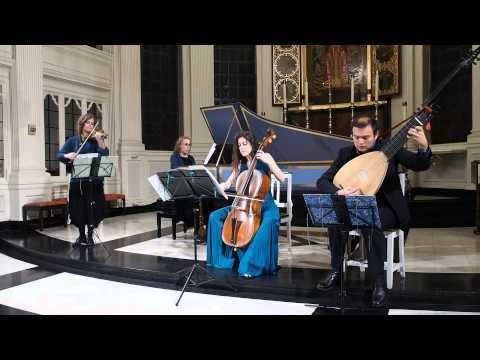 Unlike a typical chamber-music quartet consisting of two violins, a viola and a cello, Pallade Musica draws together baroque violin, baroque cello, harpsichord and theorbo: a plucked string instrument from the lute family. Tickets range from $30-$35; season subscriptions to the San Francisco Early Music Society are also available. Go to sfems.org or call 510-528-1725. As part of its ongoing artists-in-residence program, the Palo Alto Art Center presents 'lift/HEFT,' new sculptures by fiber artists Lauren DiCioccio and May Wilson. The two have been busy for the past few months creating art out of fabric donated by community members. Starting tomorrow, Saturday, Jan, 17, the results of their labors go on view to the public. The show runs through April 12, with an opening celebration on Friday, Jan. 23, from 7 to 10 p.m. In her work, San Francisco-based Wilson tends to use heavier materials including industrial felt, vinyl, nylon and concrete to explore the themes of struggle and restraint, while DiCioccio often incorporates discarded items like newspapers, magazines and plastic bags in her intricate, embroidered works. In their first-ever collaboration, the artists have employed a range of techniques: stapling, sewing, stuffing and weaving to create a series of whimsical, vaguely anthropomorphic fabric sculptures. The Palo Alto Art Center is open Tuesday to Saturday, 10 a.m. to 5p.m., Thursday, 10 a.m. to 9 p.m. and Sunday, 1 to 5 p.m. Admission is free. To learn more, go to cityofpaloalto.org or call 650-329-2366.